A large number of tips with a wide range of applications. 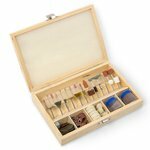 Accessories are placed in a wooden box. 10 accessories for both modifications of Pro'skit Mini Grinder: PT-5201A and PT-5201B. 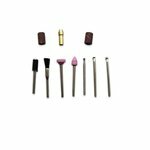 109 accessories for Pro'sKit PT-5501, PT-5201 and PT-5202 series and most of other rotary tool types.